If you asked a kid to draw an airplane there's a good chance the resulting artwork would look something like the Fairey Long Range Monoplane. Now imagine hopping in this aircraft and taking off from England for a nonstop flight to Karachi - a distance of 4130 miles (6647 kms) ! Well that's exactly what Squadron Leader A.G. Jones-Williams and Flight Lieutenant N.H. Jenkins did in 1929. Sadly a second record breaking long range flight resulted in a crash in Tunis which destroyed the aircraft and killed the two crew members. 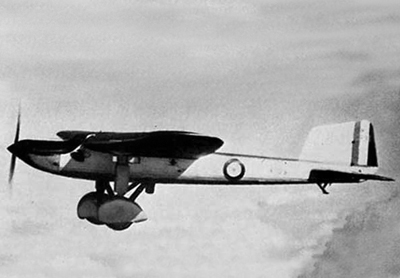 The Fairey Long Range Monoplane had a streamlined design in order to reduce drag and increase the range. 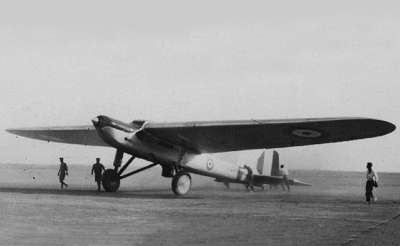 The fabric covered wings had built in fuel tanks with a total capacity of 455 litres (1000 gallons). 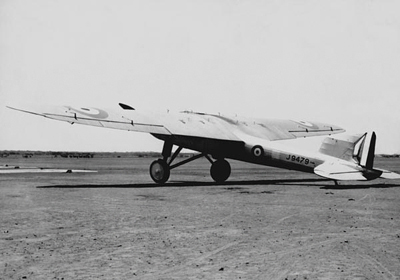 In 1933 a Fairey Long-Range Monoplane flew nonstop from RAF base Cranwell to Walvis Bay (at the time in South Africa, today in Namibia). This flight covered 5,340 miles (8,594 kms), and took 57.5 hours. The crew were Squadron Leader Gayford (officer in charge of the RAF Long Range Development Unit) and his navigator Flight Lieutenant G.E. Nicholetts. In total two examples of the aircraft were built and they made significant contributions to the advancement of long distance flight.